of our physical therapists today! Cray Physical Therapy patients are a top priority when it comes to the treatment programs that we offer. Our experienced physical therapists provide real one to one care. They evalute the patients condition in order to develop the perfect plan for recovery. Whether a patient is recovering from an injury, is experiencing physical pain, needs to improve physical ability or just has questions. We are available. Our goal in mind is to be our patients resource for life. 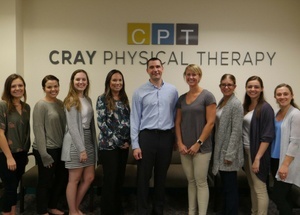 Visit Cray Physical Therapy conveniently located in both Braintree and Weymouth, MA. "Hands down, best PT on the South Shore!! I can't say enough good things about Cindy and the team in Braintree. Cindy is amazing... so knowledgeable and thoughtful in her approach to managing my PT protocol. I actually look forward to coming to PT and will be referring family members to Cindy in the very near future. The Braintree location is always welcoming, I never feel crowded or rushed. My family has tried other PTs in the area, and NONE compare to Cray PT... Five STARS all the way!" "Just a note to say how helpful and professional the people are at Cray PT in Braintree, the facility is great, easy parking and access and everyone pleasant and helpful. Highly Recommend !!!!!" "Cray Physical Therapy is by far the best facility I've been to. The staff are all amazing as well as the receptionist." "Cyndi is the best. Very knowledgeable and immediately puts you at ease. I would highly recommend." "Cray Physical Therapy is amazing. They are always able to book me for an appointment, even when it is last minute. Cyndi is a miracle worker." "I’ve been working with Tessa since June for vestibular physical therapy, and she’s great. She’s incredibly patient and never pushes you beyond what’s manageable, yet still makes sure you’re making progress each visit. She's invested in her patients and getting them better – she’ll ask for updates from recent doctors’ visits and researches/recommends additional specialists that could be helpful. Overall, Tessa has been amazing to work with!" "I have been going to Cray for about a year! Cyndi Lucas is amazing! I’ve had some pain in my neck back and arms caused by arthritis and cyndi has helped me tremendously! Not only is she very professional she’s always coming up with new and helpful ideas to help me! Cyndi is the best!" "Such a fantastic experience on initial evaluation, results driven physical therapist Tesa understood my concerns on getting back to playing sports, developed a great plan for me and follow it through. Thank you Cray and Tesa." Experiencing pain from work or sports related injuries? Getting injured while at work or from playing sports can be stressful because it means lost time. First, there is the possibility of missing significant time. Secondly, lost income from work. Thirdly, the potential of a long and challenging recovery. Our experienced team can ease that stress by focusing on getting patients back to a lifestyle that they are accustomed to. We offer a range of physical therapy and rehabilitation services for patients. This is especially crucial at the onset of an injury. An experienced physical therapist will evaluate the patients condition in order to develop the perfect plan for recovery. 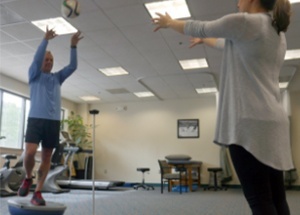 Our patients get back in motion by seeking treatment at Cray Physical Therapy. A place where we believe in exceptional patient care.